13 Reasons Why the Silver Price Will Rise From 2019 and in Years to Come | MB Magazine UK | Discover the latest in technology, reviews, guides & features. The number 13 may be unlucky for some, but not for readers of this article! Here, we explore the unique investment opportunity offered by silver in early 2019 and why this precious metal looks set for a large upwards price adjustment in the coming years. Looking at the past 100 years of silver prices, silver is currently at an average price of around $16 per oz. In the past 100 years, silver has ranged between $5.98 in October 2001 at its lowest and $115.65 in January 1980 at its highest. So, with the current price of $16 per oz, there seems plenty of scope for a price rise. The economic outlook around the world is currently troubled. Investors are looking for a safe haven for their investments, silver looks like it’s a good choice. In 2019, we are in times of economic uncertainty. Brexit is causing uncertainty within the Euro Zone. Although many people love President Trump his political antics are unpredictable and do cause some concerns in financial markets. There’s the trade war between the US and China. Many analysts are currently predicting a potential US stock market crash with equities overvalued. Monetary systems are heavily in debt, with many governments in excessive debts, especially the US government, with President Trump even warning of financial ruins ahead. All of the above create economic uncertainty and it’s well known that the price of silver performs well in economic downturns. This is because investors look to move out of investments such as equities, government bonds, etc and move into precious metals, which are seen as safe haven investments. Currently, interest rates around the world could be described as ultra-low. Whilst this is positive for some forms of investment (e.g. property), it isn’t for savings accounts, which will pay low-interest. These low-interest rates look likely for the foreseeable future with renowned market analyst Peter Schiff saying in “I think what’s going to happen is the Fed is ultimately going to take rates back to zero,” Source: Market Watch. With the silver price outlook being bullish, this is causing some investors to switch to silver from low-interest savings accounts. When a correction comes, investments need to be placed elsewhere. Silver with its low price looks one of the likely destinations. Like gold, silver can be safely classed as a form of currency. It’s highly liquid, in the sense it doesn’t take long to convert to cash and in volatile economic times and can be seen as a safer form of currency than currencies themselves! Of course, it depends on the strength of the currency you are holding. In particular, the strength of the US $ is seen to be vulnerable, with many analysts predicting a collapse of the dollar due to US debts and other factors. In times of economic collapse, investors will sell their currency-based assets and seek safe haven investments with silver being a fine candidate for acquisition. As with all products and services, prices will rise based on supply and demand. In this section, we analyse reasons why demand for silver is exceeding supply and given time this will lead to an upwards price correction of silver. 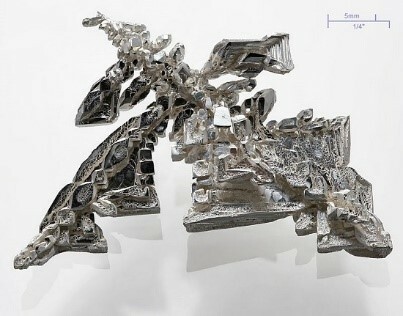 Silver is actively used in the booming solar energy industry. Silver paste is actively used in around 90% of solar cells. As sunlight strikes a silicon cell it generates electrons which are collected by silver conductors and in turn are converted into an electric current. Silver also has excellent reflective qualities, which maximise the benefits of the solar energy. India, China, Japan and the US are leading the surge to solar energy, which will massively increase the demand for silver. Solar energy usage is shown as photovoltaic usage in the chart below. 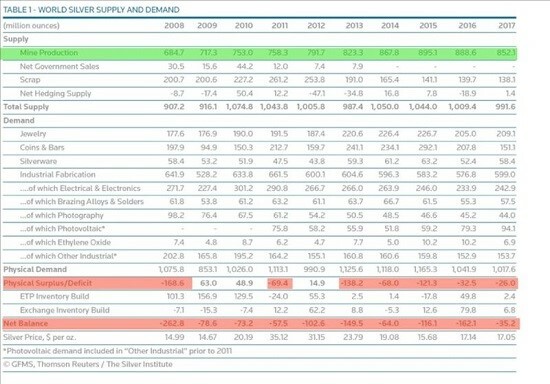 As can be seen from the chart below, the demand for silver has exceeded the supply in seven of the last 10 years. This is one of the main reasons to buy silver. The stocks of silver are dwindling and it’s perhaps when these reach ever lower levels that the price of silver will actually react to the fact that silver demand is exceeding silver supply. As can be seen from the above graph, the supply of silver has dropped each year from 2014 through to 2017. Most of the “easy to reach” silver has been exhausted, which causes production costs of mining silver to be higher on average. This combined with the current price of silver being low has caused many mines to be closed (reducing supply). In many cases, silver produced is as a by-product of mining for other metals such as copper, gold, lead and zinc. Mining for silver on its own is difficult to justify at current prices. In many cases, silver literally has no substitute. Due to its conductive qualities, uses in medicine and many other applications it literally has no substitute. It’s for this reason that irrespective of price the demand for silver will continue, which will in time impact its price. A significant investment factor as discussed earlier when buying silver is its current ratio with gold, which currently stands at 84:1. Think about this for a minute, for every 1 ounce of gold you buy you can have 84 ounces of silver! This means silver is more affordable, even to modest investors. With this affordability comes divisibility, with silver being able to be divided into smaller investments much more conveniently than gold. 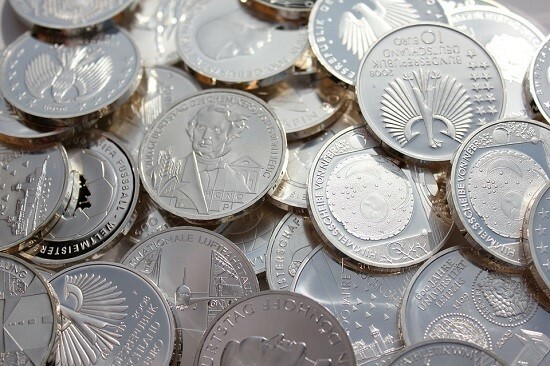 The demand for silver coins is surging in popularity, partially because of the disparity between gold and silver prices, which makes silver coins so much more affordable. 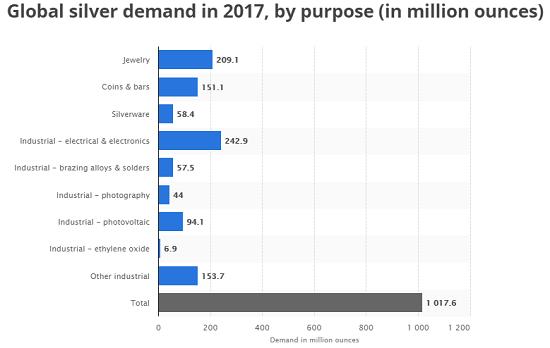 As shown in the graph above, between 2008 and 2012 the global usage for silver for coins and bars was 815.3 million ounces, between 2013 and 2017 the usage had risen to 1126.2 million ounces. This represents a sizable 38% increase over the period. 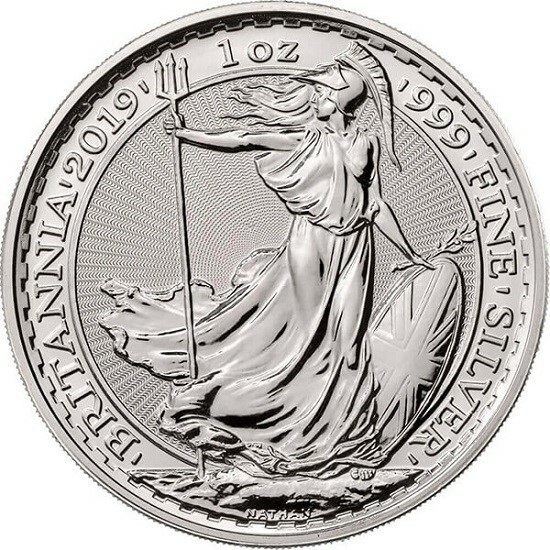 Many mints around the world now mint silver coins annually these include the American Eagle, Australian Kookaburra, Austrian Philharmonic, Canadian Maple Leaf, UK Silver Britannia and more besides. These are proving to be very popular with collectors and will stimulate demand for silver into the future. So, what’s stopping you from buying silver? We hope you have enjoyed our guide to silver and why we forecast there is going to be a strong rise in silver price in future. So, what is stopping you from buying silver? There seems little downside and a lot of upsides, why not add some silver to your investment portfolio?